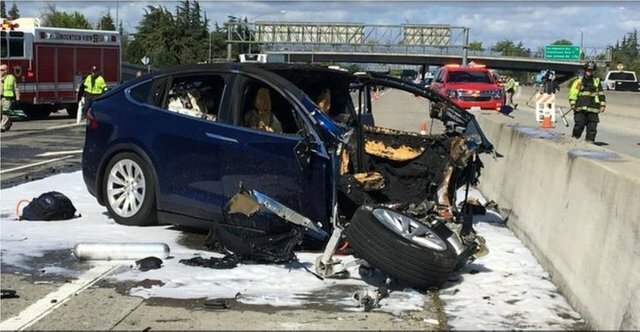 Tesla said on Friday that its semiautonomous Autopilot feature had been turned on before a fiery crash of a Model X sport-utility vehicle that killed the driver last week in California, raising more questions about the safety of the company’s self-driving technology. Federal investigators are looking into the crash in California, which occurred March 23. The company said in a statement posted on its website that the driver in the crash last week had “about five seconds and 150 meters of unobstructed view” before he crashed into a median barrier, adding that “the vehicle logs show that no action was taken.” The driver, Wei Huang, had been given “several visual and one audible hands-on warning earlier in the drive,” Tesla said. Still, Tesla defended its Autopilot hardware. In its statement, the company said there was one automotive fatality for every 86 million miles across all vehicles in the United States, compared with one fatality for every 320 million miles in vehicles equipped with Autopilot. “If you are driving a Tesla equipped with Autopilot hardware, you are 3.7 times less likely to be involved in a fatal accident,” the company said. The crash has only added to Tesla’s woes. The introduction of the company’s Model 3 has been mired in delays, and the company has continued to lose money quarter after quarter. Moody’s Investors Service downgraded the company’s credit rating, concerned that it was burning through cash. The crash occurred five days after a woman was struck and killed by an autonomous car operated by Uber in Tempe, Ariz. It was believed to be the first pedestrian death associated with self-driving technology.